Janet Whalley, a part-time resident of Bainbridge Island, is the co-author of Pregnancy, Childbirth, and the Newborn (1st edt. 2001). The award-winning book is one of the most popular childbirth books in the country, with more than a million copies in print and currently in its 4th edition. Whalley is also co-author of The Simple Guide to Having a Baby (2012). 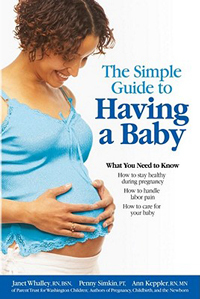 This accessible, easy-to-read guide is a simplified version of the best-selling Pregnancy, Childbirth and the Newborn and provides expectant parents with all the important do’s and don’ts regarding pregnancy, childbirth and baby care.